In Turkmenistan lies the actual door to you-know-were. This 60 meter wide and 20 meter deep gas crater is a natural gas field collapsed into a cavern, and locals are calling it the door to hell. It has been said to have been burning since 1971. The site was identified by Soviet scientists in 1971, it was thought to be a oil field by the scientists and others. So then the engineers set up a drilling rig and operations to access the quantity for the oil at the site. Soon after, the preliminary survey found a natural gas pocket the ground beneath the drilling rig and the camp collapsed into a larger crater and was buried. Since they thought the gas would hurt people, they burned it and it's been burning for roughly 50 years. Now that the basics of the location is known, let me give you some reason and logic. It is actually roughly the size of a football field. Also the only reason it caved in was because weight circumstances. But then think about it. It had a very big machine and a campsite AND lots of smaller machines on top of it - wow that's a lot of weight! Let me tell you a little bit about it's home. It is located in Derweze, also known as Darvaza. It is located in the Karakum Desert about 260 kilometers north of Ashgabat, the capital of Turkmenistan. The gas reserve found here is one of the largest in the world. 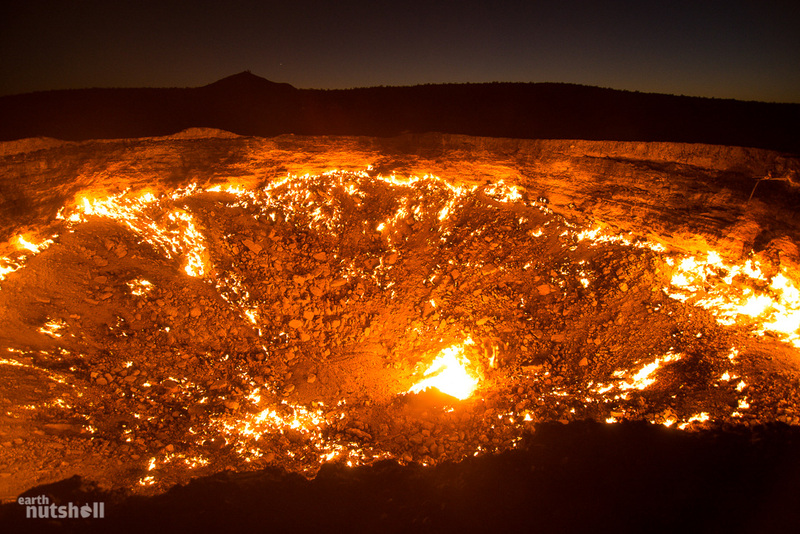 The name door to hell was named by the locals referring to the fire and hot mud and orange flames burning inside of the pit.